Cut bread slice in round shape with cookie cutter. Deep fry these slices in hot oil.Dip them in sugar syrup. Now for rabdi, Mix milk, bread crumbs, Condense milk, sugar and cardamom powder in a deep microwave safe bowl.and microwave on high for 5 minutes stirring once in between after 2 minutes. Add the cornflour paste and microwave on high for 2 minute stirring once in between. 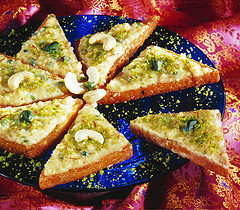 Now in a flat serving dish put a layer of shahi tukad and then spread rabdi over it. Garnish this with chopped Dry fruit and silver verk.